I want to borrow books available at my campus. 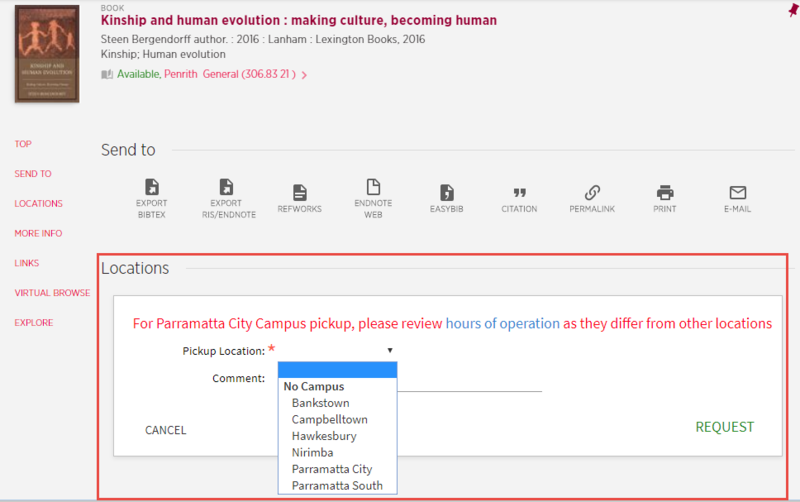 When I click on 'Sign-in' to request or transfer to another campus and select 'Request' my campus does not appear in the box next to 'Pickup Location'. You do not need to request a book if it is available at the library you are going to. If there is a copy available at your campus library you will not see your campus as a pickup location. All you need to do is locate it on the shelf using the call number. If there are no copies of the title held at your campus library, or all copies at your campus are on loan, then you can select the 'Request' option and choose your campus next to Pickup Location. Please note: The intercampus request service is only available to current Western Sydney University students, staff and Alumni members. If you are coming into the library, we cannot take online or phone requests to physically check and put books aside for you. If you cannot locate the books on the shelf, please see staff at the service desk and they will assist you to request other copies or find an alternative book.